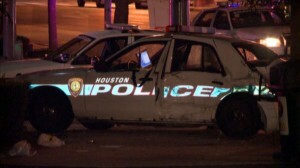 A police officer was injured and a handcuffed female passenger in the police car was killed in a two vehicle accident early this morning in downtown Houston. 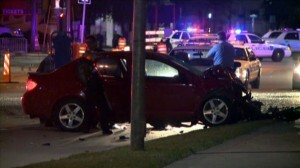 The crash happened at the intersection of Chartres Street and Texas Street at around 3:35 a.m. when a red-colored Chevy Cobalt compact car driven by a 21-year old woman crashed into the side of the police car. The officer suffered minor injuries and was taken via EMS to the emergency room to be checked out. The woman who was handcuffed and detained in the police car was thrown out of the vehicle and died at the scene. H.P.D. Sergeant Ignacia Izaguire told Channel 11 News that police department policy requires detainees be belted while they are being transported (which makes sense, because if they are handcuffed they can’t fasten their own seat belt). An investigation will be conducted to determine if that policy was followed by the 15-year veteran officer who was driving the police car.